The Isle of Guernsey, a tiny island in the English Channel off the coast of France, is the birthplace of the Guernsey cow. About 960 AD, besieged by buccaneers and sea rovers, the Island came to the attention of Robert Duke of Normandy. He sent a group of militant monks to educate the natives to cultivate the soil and defend the land. The monks brought with them the best bloodlines of French cattle - Norman Brindles, also known as Alderneys, from the province of Isigny and the famous Froment du Leon breed from Brittany - and developed the Guernsey. 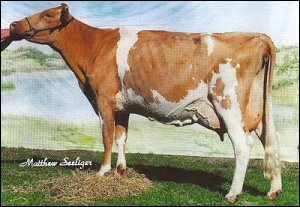 The Guernsey cow is known for producing high-butterfat, high-protein milk with a high concentration of betacarotene. Being of intermediate size, Guernsey's produce their high quality milk while consuming 20 to 30 percent less feed per pound of milk produced than larger dairy breeds. They are also known for having a lower projected calving interval and have a younger average age of first calf heifers than the larger breeds. Other attractive characteristics of Guernsey's are their lack of any known undesirable genetic recessives and their adaptability to warmer climates. The Guernsey is also an excellent grazer. She is a cow that is made for pasture-based milk production. Because of her grazing abilities, gentle disposition, calving ease and ability to efficiently produce milk with less feed than other breeds, she is the ideal candidate for intensive grazing. Dairy producers can realize her profit potential while reducing management costs. Guernsey have sound components in percentages of protein and butterfat with good solid all round milk production. Guernseys are adabtable to a wide range of farming practices. They are efficient grazers but also adapt well to feed lot or silage etc. Guernsey work well in mixed herds. They are also excellent to use in cross bred herds. Guernseys also produce A2 milk. The average weight of Bulls used for breeding: 700 kg. 2-3 years.